I recently came across an article explaining the differences between Ragout and Ragu. Not much really, the ingredients and the way they’re cooked seem pretty similar except the one originates from France (Ragout) while the other is from northern Italy (Ragu) and is most often served with pasta…surprised? No, I wasn’t either. Wikipedia explains: “The basic method of preparation involves slow cooking over a low heat. 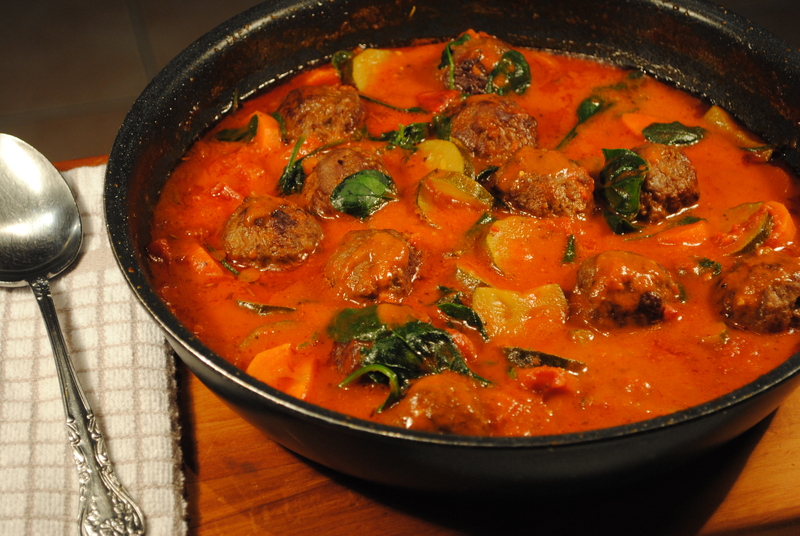 The main ingredients are many; ragouts may be prepared with or without meat, a wide variety of vegetables may be incorporated, and they may be more or less heavily spiced and seasoned. The Italian Ragu is a sauce used typically to dress pasta”. Given the cuts of meat that should be used that will soften gloriously over a few hours of gentle cooking, these types of stews are perfect for the slow cooker or crock pot, and while I enjoy the benefits and peace of mind knowing that a meal is gently bubbling away at home while I run around doing the daily routine, I don’t always see how a crock pot is as “quick and easy” as it is made out to be…you still need to chop everything and brown the meat. I personally can’t stand it when the meat has that grey look about it and you can always taste the lack of caramelization when it hasn’t been browned properly first. If I’m really organised, I can get this done in the morning before the day begins, but on those days when I’m just glad to get out of the house remembering lunches, library books, keyboard homework, swimming togs, etc. on time, preparing a crock pot full of goodies doesn’t quite fit in. That’s when this meatball recipe works a treat. I’m a firm believer in making my own meatballs so I know exactly what’s gone into them and they’re not bulked up with various types of flour and contain all sorts of artificial additives, preservatives and flavours, but I recently discovered pure Angus Beef meatballs at my local supermarket. Woohoo! This meal takes less than 30 minutes from stove to table, so perfect to prepare quickly in the evening after work. Fry meatballs in olive oil over a medium heat, turning frequently to allow them to brown evenly. When almost done, remove from the pan. Add the garlic, carrots and onion to the pan and fry until the onion is translucent. Prepare the beef stock and add to the pan along with the tinned tomatoes and tomato puree. Return the meatballs to the pan and allow to simmer gently for a few minutes. Leave uncovered and stir occasionally, allowing the sauce to reduce and thicken. Add courgette slices about 10 minutes before the end, followed by the spinach leaves about 2 minutes before you’re ready to serve. Just plonk the leaves on the top and cover with the saucepan lid. I find this steams them beautifully so they keep their colour. Finally, season the dish and give it a quick stir before serving it up – if you’re feeling a tad Italian, serve with linguine or tagliatelle ;), but it also works well with rice or creamy-buttery mashed potato that soak up the gravy – oops! Ragout. Thanks Alex, yay! So simple but delicious.